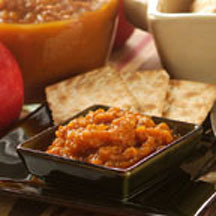 This thick and delicious pumpkin-apple butter is great spread anytime of the year. Makes a great holiday gift, too! Combine pumpkin, apple, apple juice, sugar and pumpkin pie spice in medium, heavy-duty saucepan. Bring to a boil; reduce heat to low. Cook, stirring occasionally, for 1 1/2 hours. Store in airtight container in refrigerator for up to 2 months. Makes 24 servings (2 tablespoons each). Nutritional Information Per Serving (1/24 of recipe): Calories: 30 Calories from Fat: 0 Total Fat: 0 g Saturated Fat: 0 g Cholesterol: 0 mg Sodium: 0 mg Carbohydrates: 8 g Dietary Fiber: 1 g Sugars: 7 g Protein: 0 g.